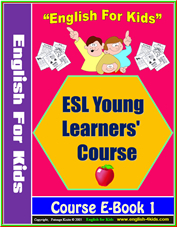 English for Kids - Book 1 Unit 3 - How old are you? This unit offers lesson plan resources for teaching kids how to say their ages by asking the question: How old are you? The resources include: a suggested lesson plan, Powerpoint presentations, Flashcards, Video Slideshow, PDF Worksheets and more. If you use a MAC please drop us a note at purchase so we can send you a MAC version. These are the resources your will be having free access to. This printable pdf lesson plan is a suggested procedure or ideas for teaching, using the resources provided. You can use this PPT to present and teach the lesson. It has everything you need. Powerpoint :Use this ppt with a projector or computer to present the language of the lesson. We provide flashcards so that if you do not have computers in the classroom, you can still effectively present the language focus. Also flashcards are useful to teachers in many ways. They can be used to practice and reinforce what has been learnt. Small-sized Flashcards : Cut out the small site flashcards and use with small groups for games like slap-and-say. Big-sized Flashcards : Use the big-sized cards to present and practice new language especially the numbers 1 to 5. Video slides are ideal for one-to-one teaching. They can also be used for self-tutoring. The video slides are simply the powerpoints as the teacher would use in class. Students can simply watch the slides before the lesson. It simply gets you all set. They are also good for review. You can mute the videos and ask students to tell you what they see. The videos are in WMV format. How old are you- I'm one : Use this worksheet to practice handwriting, reading and reinforcing the words learnt. How old are you?- I'm two:Use this worksheet to practice handwriting, reading and reinforcing the words learnt. How old are you?-I'm three: Use this worksheet to practice handwriting, reading and reinforcing the words learnt. How old are you?-I'm four: Use this worksheet to practice handwriting, reading and reinforcing the words learnt. How old are you?-I'm five: Use this worksheet to practice handwriting, reading and reinforcing the words learnt. How old are you?-1,2,3,4,5 final worksheet: Use this worksheet to practice handwriting, reading and reinforcing the words learnt. Use the puppets to practice the dialogue with the kids.